Programmable Engineering Unit Labels—psi, ft, etc. The DPS3311 series has been discontinued. Please see the CNi8C-EN series as a possible alternative. Some stock may still be available as shown in the "To Order" section. Housed in a wall-mount, watertight plastic enclosure, the DPS3311 accepts a linear voltage, current, or millivolt signal at its input; converts this into desired engineering units; and then displays the result. 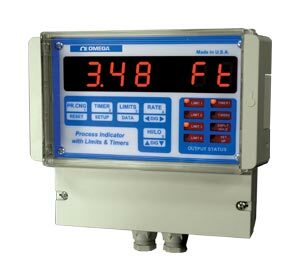 In addition, the DPS3311 monitors a number of functions, such as high and low process readings, change in process value from any given point, process run time, and rate of process change. Input signals are displayed in engineering units that correspond to the process being monitored. For example, if measuring pressure, the input signal can be scaled to give the reading directly in psi. Scaling is done using the front keys and does not require tedious formulas. A tare function is included for weighing and similar applications. For control and alarm functions, the monitor has 4 programmable limits. A built-in buzzer sounds an alarm whenever a limit is reached and any relay is activated (available with output option). Other features are process run-time indication and 2 (optional) timers with outputs. One of the process outputs can be configured as a process change alarm, another as a process rate alarm. The process change alarm activates when a process deviates by a programmed amount from a reference point. The rate alarm activates when a preset rate is exceeded or not achieved. If scan mode is selected, all the above parameters are briefly displayed in a sequence. Wall-mount process monitor 4 alarms, 2 timers. 참고: Comes with watertight connectors (2) and complete operator’s manual.